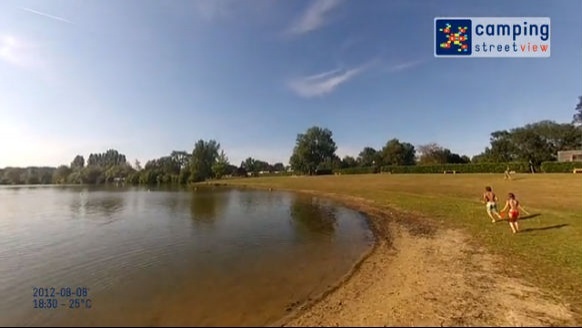 In the heart of the Loir Valley, along asplendid lake of 50 ha, the Campsite duLac des Varennes will be the ideal place topass unforgettable holidays with your family or betweenfriends. You will be allured by this area with the richestarchitectural, wine and gastronomical heritage.English is spoken at the reception. Forfait Nature avec électricité 10A. The evening entertainment, although some distance away was loud, but it did finish at midnight. Not sure if this was just a Friday night event? Easy to find, near the Motorway. An interesting site locality, with things to watch and a pleasant lake walk. Need to rember to bring loo paper to the loo and no seat!!!! Loved our stay here. Lovely clean quite pitch. Would have been nice to know about the men’s swimming trunks before we came! Toilets could have been cleaner. The bins were a long way away and there were no recycling facilities. The lake was a bit dirty. The toilets and showers were avarage, toilets were not that clean, no soap or toilet paper. Pitch was beautiful, really large and quiet. Reception spoke really good English and tried to assist in every way. Overall the site is nice. Showers were warm and fairly large. This is a very nice cosy campsite that caters for all. Bonjour Many thanks for your appreciation. We are happy for you. Isabelle et son équipe. Pitch beside the lake. Access to the river for dogs to swim in. The view of the lake was very impressive. The lady in the bar wasn't very friendly. The shop could be stocked with more food, There could be more information on opening times and whereabouts of local shops and supermarkets. The showers were mostly. Icy cold on the odd occasion they were unbearably hot. There was no control over the temperature. The pitches are large, well drained and sunny, the shower blocks are modern and clean and the lake is wonderful. The weather let this holiday down with torrential rain for three days. However on our last visit three years ago we had wall to wall sunshine. The luck of the draw. It wasn't a nature package, it was a comfort package, we had electricity. All concerning the emplacemont wa good.